Also serving communities of Minneola. There are 16 Assisted Living Facilities in the Clermont area, with 7 in Clermont and 9 nearby. The average cost of assisted living in Clermont is $3,131 per month. This is lower than the national median of $3,346. Cheaper nearby regions include Winter Garden with an average starting cost of $2,950. To help you with your search, browse the 100 reviews below for assisted living facilities in Clermont. On average, consumers rate assisted living in Clermont 4.2 out of 5 stars. Better rated regions include Mount Dora with an average rating of 4.3 out of 5 stars. Caring.com has helped 9 families in Clermont find high-quality senior care. To speak with one of our Family Advisors about assisted living options and costs in Clermont, call (855) 863-8283. Part of Lake County, Clermont is conveniently located near Disney World. Seniors who enjoy this metropolitan area can choose from over five dozen assisted living communities (ALFs), seven in Clermont and 49 in the surrounding area. ALFs are communities in which seniors receive housing, nursing care, regular meals, and personal care services. In the state of Florida, there are three types of assisted living communities including standard, extended congregate care, and limited nursing services. The Agency for Health Care Administration, Bureau of Long-Term Care Services oversees regulations regarding assisted living communities within the state. Clermont has a relatively high cost of living index of 106.8 in comparison to the national average, which is 100. This could be a potential disadvantage for individuals on a budget who are seeking an assisted living community in the area. The Clermont area is home to world-class medical facilities, including South Lake Hospital, in the event of medical emergencies or illness. Clermont's climate is excellent for anyone who enjoys warm weather year-round. The city receives 0 inches of snow per year and has a comfort index of 78 out of 100, whereas the national average is 54. Clermont has an array of community resources for seniors, including the city's parks and recreation department, an organization that promotes senior activities, such as fitness classes, discussion groups, and field trips, as well as one senior center. Clermont offers various modes of public transportation including the LakeXpress bus system, as well as transportation provided by Clermont Senior Services. The rate of violent crimes in Clermont is 28.5, which is below the national average of 31.1. However, its property crime rate is 59.6, which is notably higher than the national average of 38.1. This could be a potential concern for people searching for assisted living communities in the area because there is an increased likelihood that their car, home, or belongings may be damaged or stolen. Assisted Living costs in Clermont start around $3,131 per month on average, while the nationwide average cost of assisted living is $4,000 per month, according to the latest figures from Genworth’s Cost of Care Survey. It’s important to note that assisted living rates in Clermont and the surrounding suburbs can vary widely based on factors such as location, the level of care needed, apartment size and the types of amenities offered at each community. Individuals who are seeking the services of an assisted living facility in Clermont have various options regarding financial assistance. 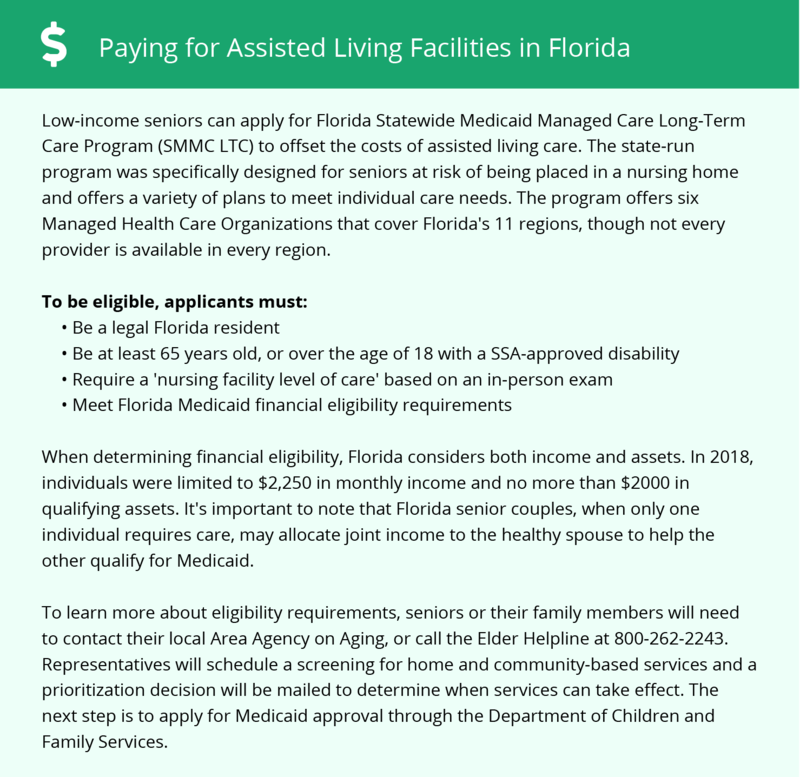 There are Medicare waivers and Optional State Supplementation Programs to help off set the cost of AL in Florida. Clermont and the surrounding area are home to numerous government agencies and non-profit organizations offering help for seniors searching for or currently residing in an assisted living community. These organizations can also provide assistance in a number of other eldercare services such as geriatric care management, elder law advice, estate planning, finding home care and health and wellness programs. To see a list of free assisted living resources in Clermont, please visit our Assisted Living in Florida page. Clermont-area assisted living communities must adhere to the comprehensive set of state laws and regulations that all assisted living communities in Florida are required to follow. Visit our Assisted Living in Florida page for more information about these laws.